This June, we’re committed to raising awareness about men’s health. 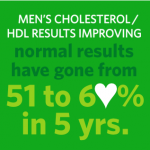 High blood cholesterol – Regular testing is recommended for men over 35. High blood cholesterol increases chances for heart disease, stroke, and poor circulation. Blood pressure – A blood pressure checkup every two years can reduce the risk of strokes, heart attacks, kidney and eye problems, and heart failure. Colon cancer – Beginning at age 50, men should be tested regularly for colorectal cancer, and the frequency of testing depends on the type of screen conducted. If there is family history of colorectal cancer, testing may need to begin before age 50. Diabetes – Men with a blood pressure higher than 135/80 should talk with their doctor about a diabetes screening. According to the Centers for Disease Control and Prevention, women are 100 percent more likely than men to seek preventative healthcare. Regular screenings can help catch these serious diseases early when they are easier to treat. Prostate cancer is the second most common cancer in American men, following skin cancer. According to the American Cancer Society, nearly one out of every six men will be diagnosed with prostate cancer during his lifetime. Total prostate specific antigen is a protein produced in the prostate gland. Elevated levels of PSA could be an indication of prostate cancer. By adding Total PSA testing to male applicants 50 years and older, prostate cancer can be identified early. View ExamOne’s test reference sheet that highlights how PSA is calculated, various study results and recommended testing guidelines. Show your support for men’s health by wearing blue this month, and get more information about prevention from MensHealthMonth.org.